Will Hydra Omnivore and Chandra's Ignition deal absurd amount of damage? By tax, do you mean having to pay for each creature attacking? If so, Nacatl War-Pride is my go to for that situation. Ypu only have yo declare 1 attacker and use kamahl and Nykthos, Shrine to Nyx to take someone out. Another option in a group game is using Hydra Omnivore against the player with the least defenses and making it big, then you can damage the tax player indirectly. As far as other suggestions, you can opt out cards like Krosan Grip or Unravel the Aether for creatures that blow up artifacts and enchantments, it would make it easier to tutor for those effects. Bane of Progress could be really good if it's a continuous problem even though I don't like having to blow my own stuff up. There's quite a few cards that are specifically in the deck for better interactions within my playgroup that can be changed out for more efficient ways to get big mana. I've been looking at adding Umbral Mantle as a third option for infinite mana and Thousand-Year Elixir as a way to speed up tapping my dorks and potential for big mana with the extra untap. Hopensome of these help. Otherwise hit me back and come up with more ideas to fight the problem. There's several cards here already that can work well in a deck with Xenagos: Ibex, Vorinclex, Fauna, Forgotten Ways, Empath, Tribe-Elder, Goreclaw, Rhythm, Bane, Nylea, Ruric, Soul, Wood Elves, Vizier, Behemoth, Muse, Hellkite, Forerunners, Farhaven, Whisperer, Genesis, Zhur-Taa. 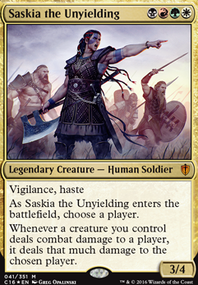 If you like the idea of Xenagos instead of Nikya then I can further help you to make changes and cuts. Sort your grammar out por favor. Es muy irritante. Pero yo penso que su deck es muy efficiente. I think you need to take out Vorinclex before our entire group hates you out of the game (preators need to be hated out anyway) and maybe add in a Hydra Omnivore if you wish to continue to be Mr. Evil Number 2 (Nick has Number 1, sorry). You might want to consider Gaea's Anthem and Gaea's Revenge . It also won't hurt to add Petalmane Baku . It is cute but can be quite dangerous. xaarvaxus on Punch the infidels! Evolutionary Leap could help upgrade any mana dorks that have outlived their immediate usefulness. Fierce Empath can get you that all-important 6+ drop. Somberwald Sage seems like a good mana dork for a deck that is half creatures. 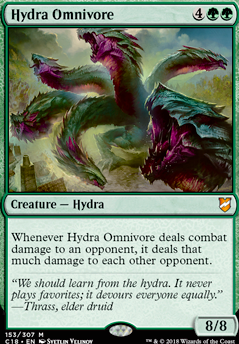 Hydra Omnivore hits all opponents and might be better than an 'X' CMC hydra off Primal Surge . Rites of Flourishing should benefit you far more than your opponents. Sheltered Thicket is a budget dual that Wood Elves can fetch. I guess the real question is what do you define as budget? I've tried to keep my suggestions to under $3 but that may be more than you're looking to spend or you may have a higher threshold for price and that would expand my list of suggestions. I run Surrak as well. A couple killer includes are Hydra Omnivore, Malignus and Genesis Hydra. Giving giant stuff trample that aren't supposed to have trample is great. A huge un-counterable Genesis Hydra is awesome. Check out the list on my profile if you want some other ideas as well. Killer list though, he's fun and relatively unplayed. WhichKing on Why can't I hold all these lands? So far your main game plan seems to be a split of Multani voltron and a tiny sprinkle of landfall effects. 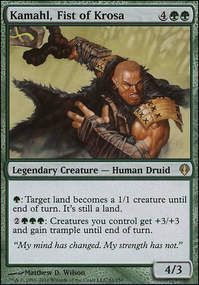 Since you are already planning on ramping to increase Multani's power, why not include a big enough force of stompy green creatures? Cards like Arbor Colossus, Ant Queen, Thragtusk, Endbringer, Hydra Omnivore, Silvos, Rogue Elemental, Elderscale Wurm, Rampaging Brontodon... just adding a decent number of these would help diversify your angle of attack. You could also include some X-spells as late game haymakers. 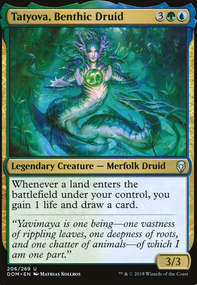 Gelatinous Genesis, Genesis Wave, Squall Line and Hurricane (You'd probably be safe if you have cards like Miren, the Moaning Well with your commander, of course you should have Life from the Loam to recur it! ).